For nearly two decades CEFA has been working towards building our Centre. We confidently believe the program it offers will prove to be the most important civics education initiative taken in Australia since federation. The inaugural Exhibition is stage 1 of the project. CEFA is now developing the supporting website as a teaching and learning program dedicated to years 5 and 6 students and their teachers. 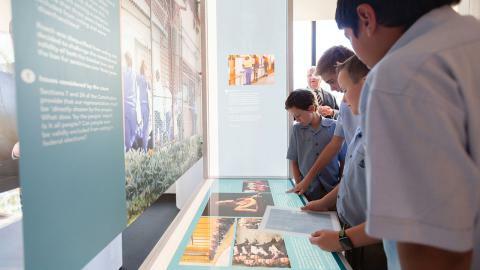 Each year they visit Canberra, and from now on our Exhibition, in their thousands. They are funded via the Australian Government PACER scheme. Over the next four years CEFA will roll out stages 2-5 of the project for secondary schools, universities and the general public. We encourage all CEFA supporters to visit the Australian Constitution Centre and explore the history and workings of our Constitution. We explain the Constitution through its six guiding principles: democracy, the rule of law, the separation of powers, federalism, nationhood and rights balanced by responsibilities. Through these principles Australians explore and understand why the Constitution was written the way that it is. The principles explain how the processes of our system of government, the institutions and the people in them function. Until now, students have not had an integrated civics education program that explains our system of government and its story. High Court decisions over the decades since federation bring the principles alive through case study presentations. What is our education program? For the first time since federation, we are providing a factual, impartial and comprehensive civics education program. We tell the history and ideas behind the writing of our unique Australian Constitution and the influences on it through the development of democratic ideas. We explore how contemporary core curriculum topics such as Aboriginal and Torres Strait Islander studies, sustainability and Australia’s role in Asia have changed as our society has evolved. And we discover how British settlement brought with it the foundation principles, institutions and values which would later give us our unique constitutional arrangements. Over the next few years we will be upgrading the Australian Constitution Centre to include many more interactive multimedia experiences. They will add further layers of in-depth knowledge for constitutional education. Users will explore digital displays to reach the information on the topics that interest them. And our Centre will continue to expand in exciting and innovative ways. Launching the inaugural Australian Constitution Centre website is now urgent. It will bring our teaching and learning resources to every year 5 and 6 classroom in Australia. Our education program fully supports, and teaches, topics within the Australian and State/Territory related curriculums. The general public will also enjoy our learning program, including through simple to hard levels of quiz programs dedicated to civics and citizenship knowledge. We hope to bring our civics resource units into every primary school teacher training institution. Currently they get no specific units in civics education. Most of the teachers don’t know the core knowledge we present in our program so they have little chance of teaching it. Our website will link to resources and experiences provided by other like-minded institutions. Our future plans include building a Constitution Centre in each of the States. None of the content will be duplicated from the Australian Constitution Centre at the High Court as each state has its own unique constitutional story. The State Centres will focus on the contributions made by the people and institutions of that State. The role of the judiciary will be explored through cases that have been initiated within the State. The principle of federalism will be expanded in these Centres, looking at the tussles between the State and Federal Governments that have shaped the Australian nation. The Australian Constitution Centre is a collaboration between the High Court of Australia, CEFA, the Australian Government who contributed a grant of $650,000 and National Archives of Australia. In May 2016 the CEFA approached this Court with an exciting idea. It had been conceived of by Ms Kerry Jones a few years before. The idea was to create a permanent exhibition of materials and memorabilia relating to our constitutional history, both pre- and post-dating the Constitution, which would be as interesting as it would be educational. 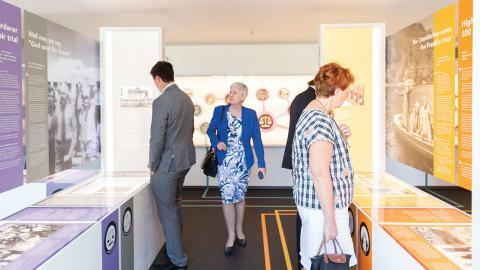 What was needed was a place to house the exhibition, a place which itself had a strong connection with the Constitution and was available to the public. This Court building was an obvious contender. The Court was delighted to be able to offer space in this building for the project and to join with the CEFA in this worthy enterprise. The Court has funded the works necessary to be undertaken to house the exhibition. The Commonwealth Government has provided funding for the exhibition itself. 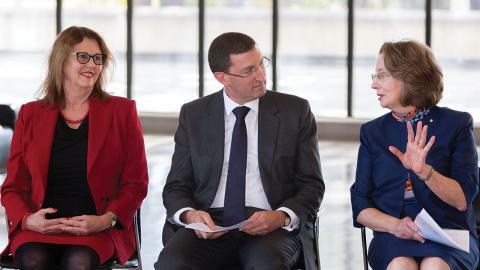 Other institutions have delved into their collections and given or loaned materials, some of which I understand have never been exhibited before...It is a great pleasure to declare the Australian Constitution Centre open. Chief Justice your role here has been decisive. You mentioned this Centre in your speech on the occasion of you being sworn in as Chief Justice. This was very important. This Centre is a chance to reverse the well documented poor understanding of Australia’s system of governance and politics. In December of last year, the National Assessment Program for Civics and Citizenship released their latest report. Its contents were concerning. Just 38 per cent of Year 10 students reached a proficient standard - a significantly lower result than in the two previous Assessments in 2010 and 2013. In a country with compulsory voting all Australians should have a solid understanding of how our democratic system works, particularly our Constitution. CEFA remains eternally grateful to the former Attorney-General, Senator George Brandis, the Minister for Communications and Arts, Senator Mitch Fifield and the Minister for Education, Senator Simon Birmingham. Each found a portion of the funding in their budgets and each saw the benefit of this project. I particularly thank the High Court for their outstanding financial and administrative support so that our dream has become a reality. This inaugural Exhibition is aimed at 11 and 12 year olds. We hope that they become excited to actively engage in our society as an Australian citizen. The future leaders and participants in our institutions of government can discover how it all works and where it has come from. I hope that governments will now see the importance of a mandatory national civics education program being taught in all Australian classrooms. This year the CEFA Board have made a decision to ensure that the Governor-General’s prize questions are able to be investigated and written about by students enrolled in a range of university courses. Our questions focus on the constitutional workings of the Australian Parliament and whether they can be improved. The competition reflects the questions that ordinary Australians are asking about our Constitutional arrangements. You can view the questions at CEFA’s website. If you know undergraduates at an Australian University who are Australian citizens please encourage them to enter. The prize money has been kindly donated to CEFA by the Flynn family. Each year, the judging panel for the Governor-General’s Prize is chaired by a Justice of the High Court of Australia. The Governor-General hosts the annual Prize award ceremony. 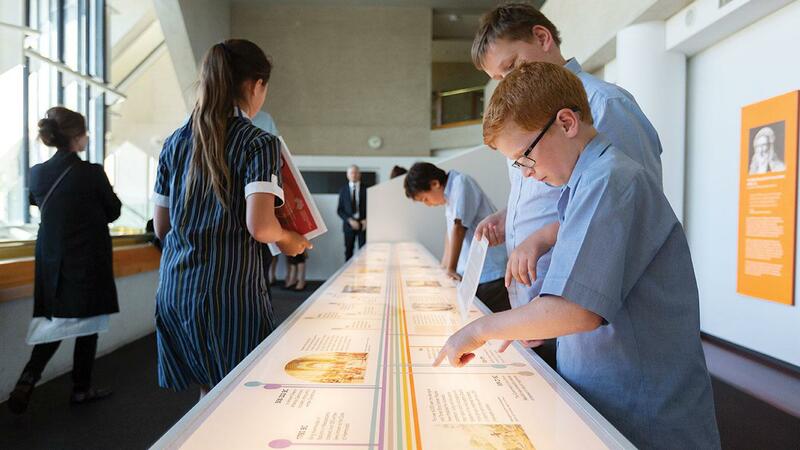 Our aim is to be able to provide a pocket constitution to every person that visits the Australian Constitution Centre. While they only cost $2 each, one for every school student does add up. Could you help us fund the Constitutions? School groups average about 50 students. If you can chip in $100 you’ll fund a pocket Constitution for each child for one school visit. And your donation is tax-deductible! CEFA supporters have been our lifeline in past years. CEFA particularly wishes to thank the Ainsworth Foundation and Lady Potter who contributed substantial donations in our downhill run to opening the Australian Constitution Centre. Together we can make a difference, bringing civics education to all Australians. Our work is vital to ensure that future generations understand and value Australia, our people, our democratic beliefs, our rights and liberties and our laws. Click here to make a tax-deductible donation.